Here is Neil MacEachain's narrative roughly derived from Blaikie's "Origins of the '45" with map references. 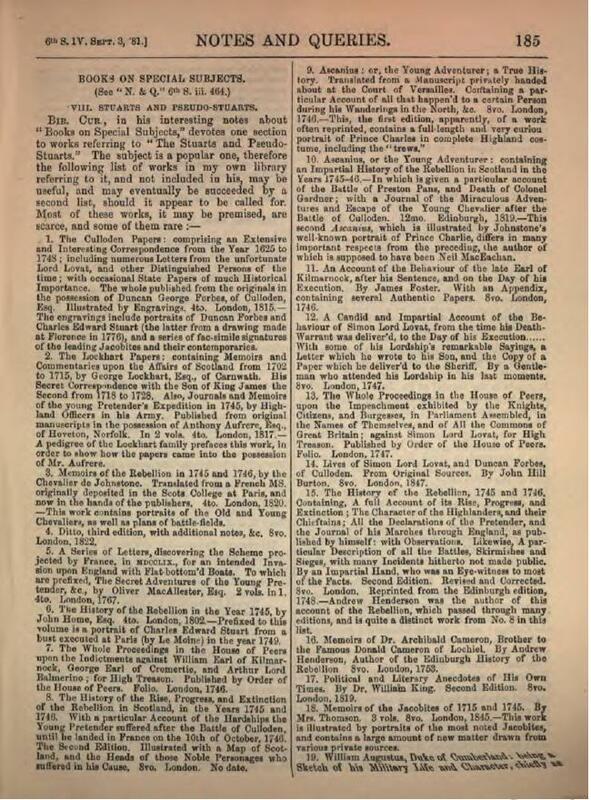 Here is Neil's narrative from the the New Monthly Magazine for 1840 (pages 323-343). Note that many of the place names are confusing and misspelled (This transcribed copy of Itinerary of Prince Charles Edward Stuart is meant to address this issue) in the original document. Add to this that a loch's name is generally two words whereas the town named after it is one i.e. Lochboisdale is a town at the head of Loch Boisdale, South Uist and Lochmaddy is a town on Loch Maddy, North Uist whereas over on the mainland the towns have "Kin" (Head of) prepended i.e. Kinlochmoidart. Even more confusing is that the same place names are found on different islands i.e. there is a Loch Eynort in South Uist as well as the Isle of Skye. Also, these documents were hand copied many times over often with more than one writer working on the same document meaning that spelling was inconsistent even, in some cases, within the same paragraph. Finally, because of the similarity of their names, many of the characters were known by the places they came from i.e. Alexander MacDonald was known as Kingsburgh as he came from Kingsburgh in the Isle of Skye and the Chief of Clan Cameron was traditionally know as Lochiel (Loch Eil) in the case of Donald Cameron, the 19th Chief, he was known as "The Gentle Lochiel". Ascanius, in the Aeneid, first used the phrase "Annuit cœptis," the root phrase of what later became a motto of the United States of America. Ascanius (son of Æneas [James]), as a reference to Charles Edward Stuart was first used in Oliphant of Gask correspondence from 1743, and later in the tract Æneas and His Two Sons (printed for J. Oldcastle 1746). It seems highly likely that Bishop Robert Forbes had a hand in both Alexis and Ascanius.His amazing collection of Jacobite material is called “THE LYON IN MOURNING OR A COLLECTION (AS EXACTLY MADE AS THE INIQUITY OF THE TIMES WOULD PERMIT) OF SPEECHES LETTERS JOURNALS ETC. RELATIVE TO THE AFFAIRS OF PRINCE CHARLES EDWARD STUART BY THE REV. ROBERT FORBES, A.M. BISHOP OF ROSS AND CAITHNESS ” and published by the Scottish History Society in three volumes. Volumes One, Two. and Three covering the period from 1745 to 1761 which were collected in ten handwritten volumes now in the National Library of Scotland (NLS). Also important is the Itinerary of Prince Charles Edward Stuart collected from the same papers and compiled by Walter Biggar Blaikie. The Lockhart papers containing memoirs and commentaries upon the affairs of Scotland from 1702 to 1746 By George Lockhart, Anthony Aufrère Volume one and two. Moidart Local History Group have a handwritten copy of the "Original Journal & Memoires of Prince Charles's Expedition into Scotland 1745-6 by a Highland Officer in his Army" and "A comparison with Lockhart" by Tim Roberton. Noel S. McFerran's excellent site The Jacobite Heritage. Join the 1745 Association! The Prince's Cairn is a Wikipedia entry developed (with help from Steve Lord, author of Walking with Charlie) for the 1745 Association. The Dictionary of National Biography (DNB) entry for John Murray of Broughton mentions Ascanius. 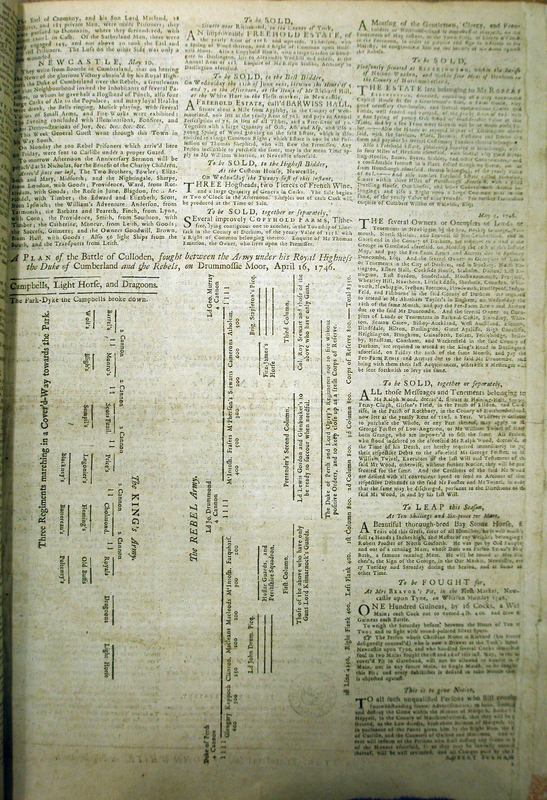 Stories from the Newcastle Courant include the battle plan of Culloden moor. The report of Captain Duff of the Terror Bomb a few days after the sea battle of Loch nan Uamh of 3rd May, 1746. 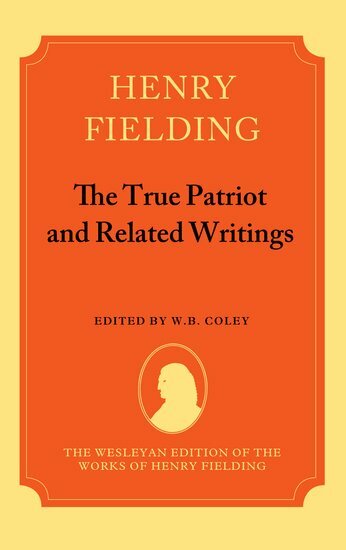 From a Whig (Buff and Blue) (although he professes no party), an anti-French, an anti-Roman Catholic, and an anti-Jacobite viewpoint, this is Henry Fielding's newspaper THE TRUE PATRIOT. Of the thirty-three issues Issue #1 Issue #2 Issue #3 Issue #4 Issue #5 Issue #6 Issue #7 Issue #8 Issue #9 Issue #10 Issue #11 Issue #12 Issue #13 Issue #14 Issue #15 Issue #16 Issue #17 Issue #18 Issue #19 Issue #20 Issue #19 Issue #20 Issue #21 Issue #22 Issue #23 Issue #24 Issue #25 Issue #26 Issue #27 Issue #28 Issue #29 Issue #30 Issue #31 Issue #32 Issue #33 from November 5, 1745 to June 17, 1746, only issue 33 has no known copy. Fielding's vehement and often exaggerated, or even invented, views were regretted as the victorious William "The Butcher" Augustus, the Duke of Cumberland's army went on a killing spree following the rebels' defeat at Culloden. The scathing attacks on the Jacobites (and of the excesses of the Roman Catholic religion) are portrayed in Henry Fielding's pamphlet (published in October 1745 shortly after the government defeat at the Battle of Prestonpans) is called The History of the Present Rebellion In Scotland. All of this pamphlet's exagerations, and historical inaccuracies, are very adequately disected in The True Patriot and Related Writings edited by W.B. Coley. Here's our Google map Jacobite Rebellion 1745-6. This book Bonnie Prince Charlie in Cumberland - J.A. Wheatley (1903) gives details around the Carlisle occupation that can't be found elsewhere. It's out of copyright, so here's the book. Florentine sculptor and goldsmith, Benvenuto Cellini (1498-1562) had an assistant named Ascanio who became the subject of Alexandre Dumas' work "Ascanio; Or, The Sculptor's Apprentices" (published 1843). These shortbread tins from Walkers are covered in Jacobite pictures. And the Drambuie recipe was supposed to be a gift from the Prince to John Mackinnon. PICKLE THE SPY or The Incognito of Prince Charles and the The Companions of Pickle. At least twenty-one editions of Ascanius were made between 1746 and 1899 as noted in"Notes and Queries - 1923 s12-XII: 172" by P. J. ANDERSON also (Notes and Queries, 1881; s6-IV: 185 - 186. ......his Cause. 8ro. London). Link to my Blog with many versions of Ascanius I have found on Google Books or (regrettably, the now defunct but much superior) Windows Live Books and other sites (includes a version in French). The digitized books sponsored by Microsoft can be found on the Internet Archive. For example, here is a list of all the books on that site with Jacobite as the keyword. http://ascaniusortheyoungadventurer.blogspot.com/ contains copies of all of the versions of the books available on the internet. Here's some of the reference works from Google books used on this site - Ascanius Library. 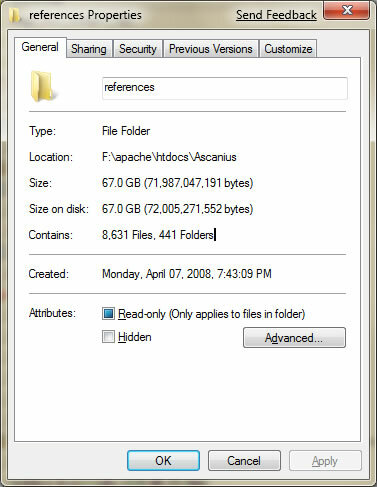 The actual local directory contains 8631 files and uses 67GB disk space. The British Library has a 1746 version that does not say "Printed for G. Smith". It also has page 29 numbered correctly. It has the shelfmark 1570/2510. Edinburgh J. Ogle, 1812. 12mo - over 6¾" - 7¾" tall, Hardcover, Half-Leather w/ Marbled Boards. 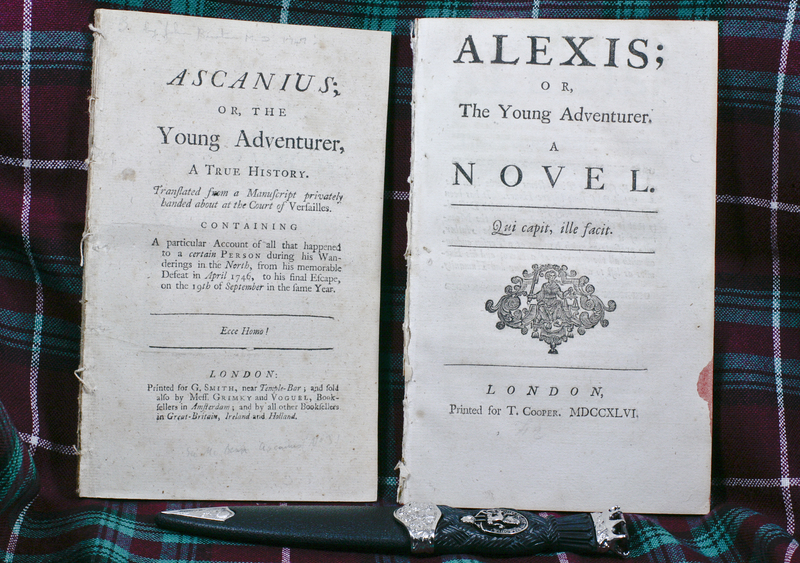 Ascanius, or, The young adventurer : containing an impartial account of the late rebellion in Scotland ... with considerable additions and improvements Published Paisley : Printed by Weir and Mc Lean for J. Davidson and Co., 1769 Edition 3rd edition. John Weir same address. Tait's Glasgow Directory 1783. "Intimation to the creditors of John Weir, bookseller in Paisley... the said John Weir, has accordingly granted a trust right of his subjects..." Glasgow Courier 9 February 1792. "Alexander Cameron, bookseller and stationer... has commenced business East end of the Old Bridge in the shop formerly possessed by the late Mr. Weir." Glasgow Courier 9 December 1794. Book Description: Edinburgh . : Printed for Stirling & Slade . 1819, Edinburgh ., 1819. 1 leaf, 150p. + fold. plan, frontis, extra illus. title page. 14 x 7 cm. Small book in orig. brown paper covered boards ( SF. & sl. stains, small hole in paper on front cover, sl. loss of lettering. ) Spine well worn, some loss of paper. IFE. ( dated 1924 ). Contents G+ ( Sl. dampstains, foxing & creasing. ]. Ascanius is Charles Edward Stuart, the Young Pretender False imprint; printer and publisher were William Faden and William Owen; about 1700 copies had been printed when Griffiths, Faden and Owen were examined over the libel in January 1746/7. Description: 1843, hb, small 8vo, 237pp, folding plan of Culloden field, orig green cloth, paper label somewhat soiled, internal browning generally, Bookseller Inventory # 1575 Bibliographic Details Publisher: George and Robert King, Aberdeen, Binding: Hardcover. containing an impartial history of the rebellion in Scotland in the years 1745, 1746. In which is given a particular account of the battle of Prestonpans, and the death of Colonel Gardiner. With a journal of the miraculous adventures and escape of the young chevalier after the battle of Culloden. Also plans of the order of the battle on Falkirk and on Culloden Moor. Embellished with engravings. 1822 - English Book 216 p. : ill. (port.) folded plans, plates ; 17 cm. Glasgow : Printed by Khull, Blackie, & Co. and A. Fullarton & Co. Edinburgh. containing an impartial history of the rebellion in Scotland in the years 1745-1746 : to which is added a particular account of the battle of Prestonpans, and death of Colonel Gardner with a journal of the miraculous adventures and escape of the young chevalier after the battle of Culloden and a description of the manners of the Highlanders, their dress, armour, &c., &c., &c.
1821 - English Book 196 p. ; 15 cm. Cupar : Printed by and for R. Tullis and sold by all the Booksellers. Paisley, Printed by J. Fraser, 1825. 162 p. 16 cm. Book Description: W S Sime, 1890. An impartial history of the rebellion in Scotland in the years 1745-76, to which are added, a journal of the adventures and miraculous escape of the Young Chevalier and a description of the manners of the Highlanders, their dress, Armour, etc. 12mo. 144pp. H/B. No d/w. Generally soiled and worn. Book Description: Geneve 1747. Contenant un recit tres-cironstancie de tout ce qui est arrive de plus secret & de plus remarquable au Prince Charles-Edouard Stuart, dans le Nord de l'Escosse, depuis la bataille de Culloden donnee le 16 Avril 1746 jusqu'a son embarquement arrive le 19 Septembre de la meme annee. Traudite de l'Anglois et augmentee d'un grand nombre de remarques historiques. 12mo.,155pp. Full leather with gilt trimmed edges. Good, some light foxing throughout, spine ends a bit frayed and lightly worn down. Book Description: G. Miller, (n.d.), London, 1746. 3/4 Leather. Book Condition: Good. Dust Jacket Condition: NA. First Edition. 4 7/8" x 7 3/4". "Translated from a manuscript privately handed about at the Court of Versailles. ", 64 pp.(1746). Contemporary 3/4 tan leather with stitching on the spine and corners; marbled boards and edges. Modern red leather label with gilt lettering. Corners rubbed, edges have wear. Book Description: Lille and Lyon 1747., 1747. Ascanius ou le jeune avanturier. Histoire veritable, contenant un recit très-circonstancié de tout ce qui est arrivé de plu secret & de plus remarquable au Prince Charles-Edouard Stuart, dans le nord de ;'Ecosse, depuis la bataille de Culloden donnée le 16/27 Avril 1746 jusqu'à son embarquement arrivé le 19/30 Septembre de la m�me année. Traduite de l'Anglois, et augmentée d'un grand nombre de rémarques historiques. Lille: chez Jacquet; et à Lyon: chez les Frères De-Ville, 1747. 144 pp. Sm. 8vo, contemporary half calf (some rubbing). First edition in French; first published in London the year before. A translation of the first portion to be published on a novel romanticizing the career of the Young Pretender. The English text appeared as a 64-page pamphlet, with a false imprint, and the author, along with booksellers involved, were summoned for an examination by the authorities. This part of the novel was then quickly incorporated as Book II of the longer version (translated into French in 1763). Title-page a trifle dusty, otherwise a very good copy; with the armorial Strathallan bookplate. Very scarce. Rochedieu, p. 45 (wrongly listed under John Burton). Ascanius; or, the Young Adventurer Griffiths, Ralph Bookseller: Ximenes Rare Books Inc., ABAA, ABA, ILAB (Kempsford, Gloucestershire, , United Kingdom) Price: US$ 680.52 [Convert Currency] Shipping within United Kingdom: US$ 6.32 [Rates & Speeds] Add Book to Shopping Basket Book Description: London 1746., 1746. Ascanius; or, the young adventurer, a true history. Translated from a manuscript privately handed about at the court of Versailles. Containing a particular account of all that happened to a certain person during his wanderings in the north, from his memorable defeat in April 1746, to his final escape, on the 19th of September in the same year. London: printed for G. Smith; and sold also by Mess. Grimky and Voguel, booksellers in Amsterdam; and by all other booksellers in Great-Britain, Ireland and Holland, n.d. (1746). 64 pp. [Bound with:] [Anon.] Genuine memoirs of John Murray, Esq; late secretary to the Young Pretender. Together with remarks on the same, in a letter to a friend. London: printed for J. Wilford, 1747. (2), 64 pp. Together two vols. in one, 8vo, recent marbled boards, calf, spine, spine gilt. First edition of each title. printed by Weir and McLean. For James Davidson and Co.
[Burton, John, M.D.] 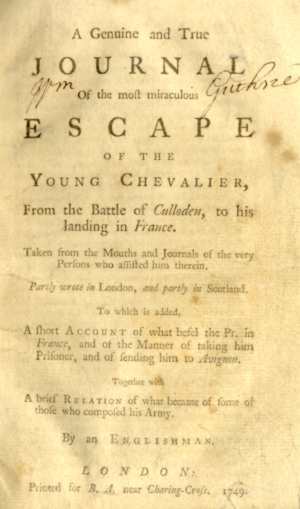 A genuine and true journal of the most miraculous escape of the Young Chevalier, from the Battle of Culloden to his landing in France; taken from the mouths of journals of the very persons, who assisted him therein, partly wrote in London, and partly in Scotland. To which is added, a short account of what befel the Pr. in France, and the manner of making him prisoner, and sending him to Avignon, and from his departure thence, as supposed for Scotland, &c. Together with a brief relation of what became of some of those who composed the army. By an Englishman. London: printed for W. Webb, 1749. (6), 81 pp. 8vo, old half calf (rubbed, front cover detached). First edition. The author of this sympathetic account of the Young Pretender was a physician now best known for his portrayal by Laurence Sterne as "Dr. Slop," in Tristram Shandy. One leaf of the preface bound out of order; repairs to the foot of the title-page, and to two other leaves, with small loss of text (but entirely intelligible from the context). [Griffiths, Ralph.] Ascanius ou le jeune avanturier. Histoire veritable, contenant un recit très-circonstancié de tout ce qui est arrivé de plu secret & de plus remarquable au Prince Charles-Edouard Stuart, dans le nord de ;'Ecosse, depuis la bataille de Culloden donnée le 16/27 Avril 1746 jusqu'à son embarquement arrivé le 19/30 Septembre de la même année. Traduite de l'Anglois, et augmentée d'un grand nombre de rémarques historiques. Lille: chez Jacquet; et à Lyon: chez les Frères De-Ville, 1747. 144 pp. Sm. 8vo, contemporary half calf (some rubbing). First edition in French; first published in London the year before. A translation of the first portion to be published on a novel romanticizing the career of the Young Pretender. The English text appeared as a 64-page pamphlet, with a false imprint, and the author, along with booksellers involved, were summoned for an examination by the authorities. This part of the novel was then quickly incorporated as Book II of the longer version (translated into French in 1763). Title-page a trifle dusty, otherwise a very good copy; with the armorial Strathallan bookplate. Very scarce. Rochedieu, p. 45 (wrongly listed under John Burton). [Griffiths, Ralph.] Ascanius; or, the Young Adventurer, a true history. Translated from a manuscript privately handed about at the court of Versailles. Containing a particular account of all that happened to a certain person during his wanderings in the north, from his memorable defeat in April 1746, to his final escape, on the 19th of September in the same year. London: printed for G. Smith; and sold also by Mess. Grimky and Voguel, booksellers in Amsterdam; and by all other booksellers in Great-Britain, Ireland and Holland, n.d. (1746). 64 pp. [Bound with:] [Anon.] Genuine memoirs of John Murray, Esq; late secretary to the Young Pretender. Together with remarks on the same, in a letter to a friend. London: printed for J. Wilford, 1747. (2), 64 pp. Together two vols. in one, 8vo, recent marbled boards, calf, spine, spine gilt. First edition of each title. Ascanius is a fictionalized account of the Young Pretender, whose defeat in the Rebellion of 1745 had a romantic appeal which the government was not keen to have disseminated. The imprint here is entirely false. 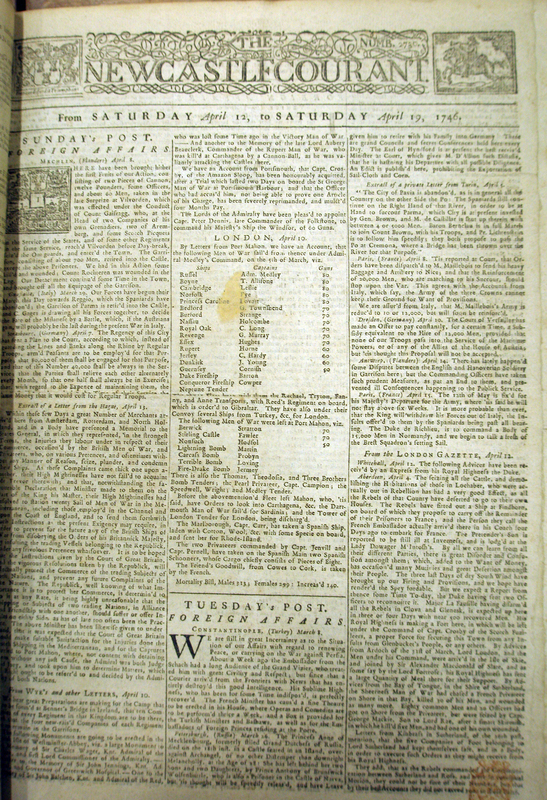 Some 1700 copies had been printed when the author, and the booksellers involved, William Faden and William Owen, were examined for libel in January, 1746/7. In fact attempts to suppress the text were useless, and this pamphlet quickly reappeared as Book II of a longer version. The book used to be ascribed to John Burton, but records of the legal action reveal that it was written by Ralph Griffiths, a bookseller and publisher who founded the Monthly Review in 1749. Cf. Beasley 202 (the full version only); CBEL II, 2078. The second work is the best early account of John Murray of Broughton, one of the Young Pretender's most trusted associates. After the Battle of Culloden, Murray was captured and taken prisoner to London, where he turned king's evidence and testified against the Jacobites; his reputation never recovered. CBEL II, 2076. An appealing pair, in fine condition. The three French translations (Lille and Lyon - 1747, Geneva - 1747, and Edimbourg - 1763) are by d'Intraiguel and Langford Heyland. Burton, John. Born in 1696 and died in 1771, authored "ASCANIO ó el Jóven Aventurero, Historia verdadera, que contiene una relacion muy circunstanciada de todo lo mas secreto. y mas particular, que sucedió al principe Carlos Eduardo Stuard en el Norte de Escocia, desde la batalla de Culloden, dada el dia 27 de abril de 1746, hasta su embarco, que fué el 30, de septiembre del mismo año. Traducida del Frances, y aumentada de muchas notas históricas, con privilegió del Rey Nuestro Señor. Madrid (no dice el añ0), imprenta del Mercurio. En 8º prolongado, 220 páginas." Published in 1750 (possibly "Madrid, 1747. Gaceta, 20 de junio de 1747."). Sanfärdig historia om Ascanius, innehållandes en omständelig berättelse, på alt det, som händt printz Charles Edouard Stuart, uti norra Skottland ifrån bataillen wid Culloden den 16/27 april 1746, til den 19/30 septemb. samma år. Öfwersatt : på swänskan från fransyskan, 1747. Stockholm, tryckt hos directeuren och kongl. boktr. i stor-förstendömet Finnland, Jacob Merkell, 1748. Stockholm, 1748 : 96 s. ; 8:o.
P. J. ANDERSON ‘ASCANIUS, OR THE YOUNG ADVENTURER’ Notes and Queries 1923 s12-XII: 172; doi:10.1093/nq/s12-XII.255.172-a [PDF]. A useful bibliography of Jacobite Literature is attached to chapter XIV section E of The Cambridge history of English literature, Volume 9. "Upon this spot is erected the gallows for the county of Surrey; but few have suffered here of late years. Such of the (Scottish) rebels as were tried by the Special Commission, in 1746, and ordered for execution, suffered at this place; amongst whom were those who commanded the regiment raised at Manchester for the use (service) of the Pretender." In fact, very many of those who had "been out" in the Scottish rising of the previous year here suffered the last penalty of the law. Among them were Sir John Wedderburn, John Hamilton, Andrew Wood, and Alexander Leith, and also two English gentlemen of good family, named Towneley and Fletcher, who had joined the standard of "Bonny Prince Charlie" at Manchester (they were collectively known as "The Manchester Rebels"). Wood, it is said, bravely drank a glass to the Pretender's health on the scaffold. Others engaged in the same cause also suffered here; among them Captain James (or, as he is still called, "Jemmy" ) Dawson, over whose body, as soon as the headsman's axe had done its terrible work, a young lady, who was attached to him tenderly, threw herself in a swoon, and died literally of a broken heart. A ballad. Written about the time of his execution, in the year 1746. Ye tender hearts and lovers dear! Nor need you blush to shed a tear. And thou dear Kitty! peerless maid! And pity every plaint--but mine. And dearly was he loved again. And spotless was her virgin fame. O had he never seen that day! When Jemmy's sentence reach'd her ear! So pale, or yet so chill appear. "O Dawson! monarch of my heart! For thou and I will never part. Should learn to lisp the giver's name. To share the cruel Fates' decree." She had not loved her favourite more. With calm and steadfast eye she saw. "Yet, yet," she cried, "I follow thee. And let us, let us weep no more." And, sighing forth his name, expired. So sad, so tender, yet so true. It is said, that after the loss of that day, an English captive telling a French officer, that they had been very near taking the Duke prisoner, the Frenchman replied, " We took care of that; he does us more service at the head of your army." The flowering plant Dianthus barbatus was named 'Sweet William' after him; in Scotland, however, the foul-smelling ragwort Senecto jacobaea was nicknamed 'Stinking Willie'.